India's rapid economic growth offers obvious opportunities for foreign investors, but making wise investing decisions can be difficult for any investor without a deep knowledge of the country and its culture. With a vibrant democracy and an active press, India can be a complex and chaotic place in which investors can find it difficult to make investing decisions with confidence. 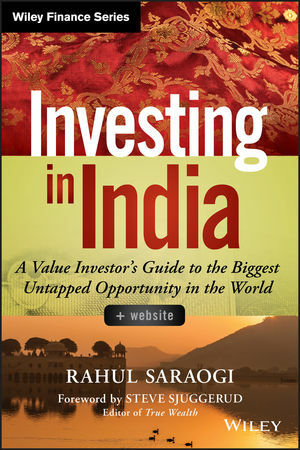 This book offers an on-the-ground perspective on India from one of India's most successful value investors. Looking deeply into the internal realities that impact India's investment climate, Investing in India helps investors both inside and outside the country cut through the noise and find the facts that truly matter for anyone who wants to invest there. RAHUL SARAOGI leads Atyant Capital Advisors, advisor to the Atyant Capital family of funds. In the last 14 years he has focused on the Indian markets. His mission is to consistently identify the best 10-15 investment ideas from among the thousands of publicly-traded Indian corporations. Rahul’s value-based investment philosophy stands apart due to his belief in the paramount importance of corporate governance, specifically how management operates with its minority shareholders in mind. While getting his undergraduate education at the University of Pennsylvania’s Wharton School, he discovered Warren Buffett, Charlie Munger, Benjamin Graham, Phil Fisher, and Robert Cialdini.